Finally an easy to use 2-stage snow blower - the Power Max HD 928 OAE 2-Stage Snow blower has many features to make your snow clearing job easy and yet is built tough to give you years of dependable performance. A breakthrough in snow blowing technology, the Power Max Anti-Clogging System (ACS) reroutes excess snow to prevent clogging and maximizes impeller speed and velocity. The patented Quick Stick control allows you to quickly and easily change chute direction and angle with 1 simple control. Power Max snow blowers are built tough with special hardened gearbox gears, designed to withstand the highest of stresses and resist wear unlike softer competitive gears in addition to a 1-piece frame for maximum strength while others use a 2-piece frame that has a weaker bolted joint in the middle of the machine. It has a 3-year limited warranty on the machine and engine and the chute, deflector and ACS are guaranteed for life. 265cc Toro premium OHV engine with 6 forward and 2 reverse speeds. Electric start - simply push the button and you're ready to go. Automatic Steering allows smooth, tight turns without triggers. Commercial grade auger gearbox designed to withstand the highest of stresses and resist wear. Durable steel construction in the housing, frame and chute. 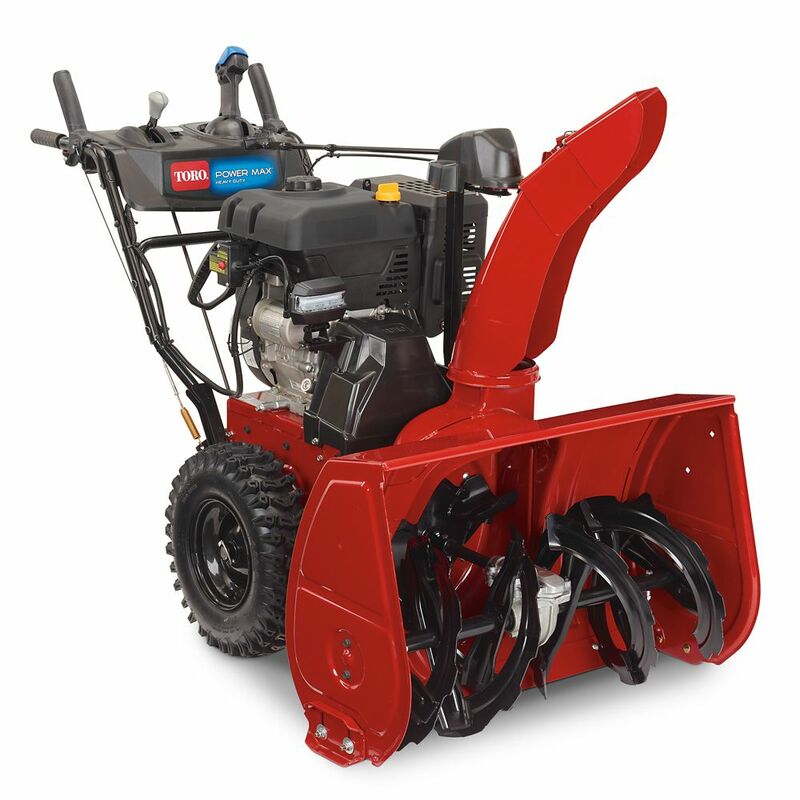 Ideal for clearing 6 plus inches of snow off large driveways and walk ways. 28 in. clearing width and can clear up to 21 in. deep in 1-pass, throwing snow up to 45 ft. away. The Power Shovel utilizes its exclusive Power Curve<sup></sup> design to clear snow up to 6-inches deep and 12-inches wide from sidewalks, steps, decks, and small driveways with a powerful 7.5 amp motor that throws snow up to 20 ft. The lightweight Power Shovel also features easy-to-use adjustable handle controls and offers efficient storage capability, plus it's maintenance free. Extension cord not included. Power Max HD 928 OAE 28 in. 2-Stage Electric Start Gas Snow Blower Finally an easy to use 2-stage snow blower - the Power Max HD 928 OAE 2-Stage Snow blower has many features to make your snow clearing job easy and yet is built tough to give you years of dependable performance. A breakthrough in snow blowing technology, the Power Max Anti-Clogging System (ACS) reroutes excess snow to prevent clogging and maximizes impeller speed and velocity. The patented Quick Stick control allows you to quickly and easily change chute direction and angle with 1 simple control. Power Max snow blowers are built tough with special hardened gearbox gears, designed to withstand the highest of stresses and resist wear unlike softer competitive gears in addition to a 1-piece frame for maximum strength while others use a 2-piece frame that has a weaker bolted joint in the middle of the machine. It has a 3-year limited warranty on the machine and engine and the chute, deflector and ACS are guaranteed for life. Power Max HD 928 OAE 28 in. 2-Stage Electric Start Gas Snow Blower is rated 3.8 out of 5 by 25. Rated 5 out of 5 by Bill33 from Very strong blower even in heavy and wet snow I've only had the blower a couple months and still getting use to it. It's very powerful and has been able to handle some pretty heavy and wet snow with no problem including the heavy deep pack at the end of the driveway. I'm still not use to the automatic steering to give a fair comment. When letting go of the auger or transmission handle its very sensitive and will disengage requiring you to stop and re-grab both handles to reengage. Overall very happy so far. Rated 5 out of 5 by Juice from Excellent 2 stage snow blower!... Excellent 2 stage snow blower! Rated 4 out of 5 by BobbyJ from Impressive machine This is the second Toro snowblower I have owned. I had the first one for 14 years; it functioned well but I have some trouble with the linkages. Also, an ice chuck buried in the snow caused a lot of damage to the machine. The new Toro is built more solidly, having metal instead of plastic parts in key places. It is quieter and controls are easier to use. The instruction displays on the machine are also helpful. Rated 5 out of 5 by JeremyB from Another great Toro product! Love this snowblower. I'm a homeowner but I could start a commercial business with it because it works so well. Rated 4 out of 5 by PeterB from Well made, throws snow very far. Steering is jumpy... Well made, throws snow very far. Steering is jumpy on rough terrain, auto-lock on auger control is very sensitive, and I’d prefer the auger and drive controls to be reversed, but overall a good machine that works as advertised. Rated 2 out of 5 by waukon from Broken starter cord I have used the blower 7 times. The third use, the gear that holds the blower chute stopped working and the chute would not stay in place. I had to loosen the bolt that lets the gear move into the proper position. Today, I changed the oil after 5 hours of use. I pushed it out of the garage and pulled to start and the starter cord broke. I now have only the electric start and no electricity to the shed where it is stored. It does a great job of throwing the snow but these service items makes me wonder about the quality of the blower. Rated 5 out of 5 by Punkin from Works well in heavy snow. We just had the snowiest February ever recorded. My Toro took it in stride. At 76 I appreciated the fact that it could handle deep snow and drifts without a lot of effort on my part. The controls are easy to master and work well.